Help your child get to know the most elementary of the elements with this handy worksheet on potassium. This list of elements is missing mega-information: a combination of category, name, number, or symbol. Can your fifth grader fix them up? These "Treehouse Triangle" worksheets break down geometric rules into easy, solvable steps. 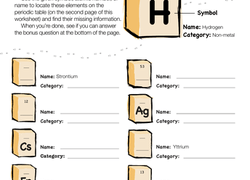 Help your child get to know the most elementary of the elements with this handy worksheet on sodium. This worksheet asks kids to reflect on the feedback they were given on their writing, including observations on the process and next steps. Beginning writers, find inspiration from a few famous authors, with this reading and writing activity based on the influences of Robert Louis Stevenson! This worksheet teaches the art of argument writing by presenting four statements that students must either agree or disagree with. Have students group statements about decimals in this activity-based worksheet. Tape diagrams are so versatile, and this worksheet shows it! Use these vocabulary cards with the EL Support Lesson: Comparing Two Division Methods. Use this glossary with the EL Support Lesson: Comparing Two Division Methods. Help students create their own division word problems! Use these vocabulary cards with the EL Support Lesson: Division with Fair-Sharing Language. Use this glossary with the EL Support Lesson: Division with Fair-Sharing Language. How does our hearing work? Give your child a great guide to the anatomy of our ears with this anatomy worksheet. Use these vocabulary cards with the EL Support Lesson: Part-Whole Division Sentences. Use this glossary with the EL Support Lesson: Part-Whole Division Sentences.